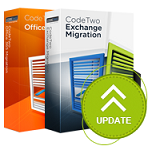 CodeTwo Exchange Migration 1.6.0 and CodeTwo Office 365 Migration 1.6.0 released! Today we have published new versions of our migration software – CodeTwo Exchange Migration and CodeTwo Office 365 Migration. Both programs are now available for download in version 1.6.0. This release contains a number of small programmatic fixes, new reporting features and migration statistics visible in the GUI, and more importantly the migration speed improvements. The migration can be now even up to 5 times faster thanks to the new data transmission optimization technology implemented in this version of the software. For full list of changes go to the CodeTwo Exchange Migration version history or CodeTwo Office 365 Migration version history. CodeTwo Exchange Migration is a program that lets you transfer user’s mailboxes between Exchange servers, within or even outside of the same domain. It also allows to perform direct migration from Exchange 2003 to Exchange 2010 or 2013 without any mid-steps. Similarly, CodeTwo Office 365 Migration allows to migrate mailboxes from the on-premise Exchange server to Office 365 organization without a hassle. Moreover you can get and use the CodeTwo Office 365 Migration program free of charge.